Buying a home is a major undertaking, and one that is likely to be the biggest investment of most people’s lives. If you plan on living in this property for a couple of years, or you want to turn it into your forever home, it’s important to plan ahead and find the best route for meeting your goals without stress, high costs, and unexpected setbacks. If you are looking to buy a home along the Texas Panhandle, it is a good idea to determine whether you are in need of a new or used property. Investing in a new property can provide a wide range of benefits for buyers across Texas, yet many potential homeowners are not aware of how beneficial and affordable a brand-new home can be. B&M Asset Group, LLC is here to provide the best real estate experiences for buyers of all budgets. We specialize in new home construction across Amarillo, purchasing numerous plots of land to build in phases. This allows for quality construction with affordable, customizable results. If you have never considered purchasing a new home, our team may be able to provide an ideal plan to best equip you and your loved ones for a successful future. Today, we’ll highlight four reasons why you should consider buying a new house. Moving into an old home can provide comfort and charm, but when it comes to daily life, things may become more complicated. Outdated appliances, for example, can cause a serious drain on the energy grid as well as your wallet. Rusty stoves, leaking washing machines, and outdated air conditioners can all cause a lot of stress, and taking the time to replace or retrofit these appliances in your old home may prove to be even more costly. B&M Asset Group, LLC relies on the most cost-effective building methods in the industry to provide high-quality outcomes that deliver on luxury and comfort without the high price tag. 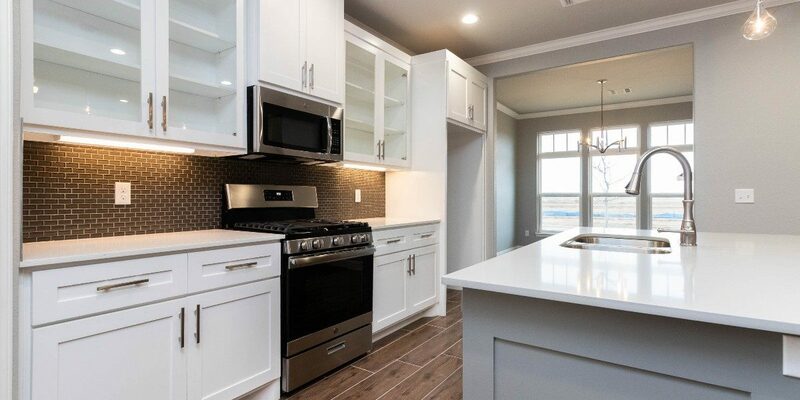 Beyond the marble countertops and crown moulding, our home builders also provide new, attractive, energy efficient appliances to make the most of your space. Our current phases are utilizing the beauty and durability of stainless steel to create kitchen spaces that are contemporary and affordable. One of the most obvious advantages of purchasing a home versus renting one is the stability you will experience. As long as you make your payments, you are free to stay in your place forever. Moving from lease to lease, and paying ever-rising rental prices, is not something that most people look forward to. New homes provide the peace of mind knowing that everything is new, and the property has a long lifespan ahead of it. Older homes have their own benefits, and many people have sought out antique properties to create a unique setting, but keep in mind that every building has a projected lifespan. If the property you want to invest in is over 100 years old, be sure to consider the risks! Buying a new home in Texas can be an exciting process, but moving into your new abode when it has seen dozens of tenants over the years can result in a serious need for TLC. Instead of dealing with new carpet, installing new appliances, or repainting the walls, many buyers learn how beneficial it can be to invest in a new construction home. It is also helpful to know that you have been the only person in this home, as any discrepancies in workmanship or treatment will come down to your family or your builders. Once you settle into your new place, you may begin to notice that your maintenance needs are not as intensive as older homes. Modern home developers are always looking to minimize upkeep and increase sustainability for buyers, delivering floor plans and materials that are designed to make life a little easier. Next time, we’ll continue this discussion by highlighting four additional reasons why purchasing a new home is a smart way to go. B&M Asset Group, LLC of Amarillo proudly provides new home construction that relies on our proven process to save costs and create the most value. We also offer new home financing options, including our partner’s unique lease-to-purchase program and trade-in options. Contact us today to learn more, and see how our building contractors can create ideal solutions tailored to your goals! Purchasing a new home allows you to move in right away, without the need for updates or repairs. Ready to get started? Contact us online!